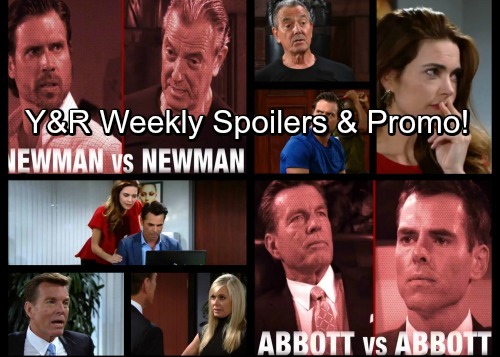 The Young and the Restless (Y&R) spoilers for the week of October 2-6 tease that we’ll see some fierce family wars. For starters, there’s Victor (Eric Braeden) and Nick’s (Joshua Morrow) ongoing battle. Vic’s about to push Nick to his limit! After Kevin (Greg Rikaart) drains the bank accounts, it won’t take long for Nick to figure out that Victor orchestrated this attack. Nick will fill Chelsea (Melissa Claire Egan) in on his balance of zero and she’ll be equally outraged. The Young and the Restless spoilers state that an investigation will confirm Nick’s suspicions. He’ll head off to confront Victor, but it appears he’ll also end up catching Kevin. Of course, Nick may not have proof that would hold up in court. Victor will undoubtedly feel like he got the last laugh, but perhaps he shouldn’t be so quick to chuckle. 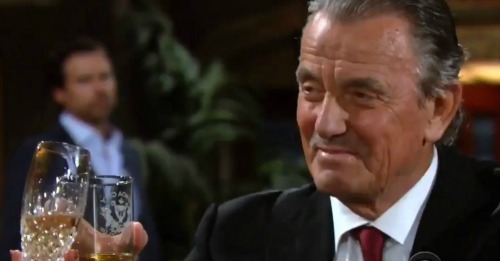 Y&R spoilers hint that Nick will immediately plot payback. There’s no way he’ll let Victor get away with his sneaky move. Meanwhile, another revenge scheme will work like a charm. Jack (Peter Bergman) will be pleased when Billy (Jason Thompson) takes the bait. The Young and the Restless spoilers say Billy and Victoria (Amelia Heinle) will believe they found a juicy secret. They’ll hope to gain a serious advantage once they learn Jabot’s new strategy. Unfortunately, Brash and Sassy is likely headed for a devastating blow. The info is bogus, so whatever Victoria and Billy pull is destined to backfire. Ashley (Eileen Davidson) will worry about the battle that’s escalating within the Abbott clan. She doesn’t approve of what Billy’s doing, but she’ll fear that Jack’s going to cause irreparable damage. However, Jack won’t be too concerned. He doesn’t think there’s any chance of making amends with Billy, so he might as well go after him. Jack will be convinced that he’s going to crush the rival company and destroy Billy in the process. Achieving this goal is certainly his priority right now. When will Billy and Victoria catch on? Will they be able to avoid disaster or will Jack’s plan pay off? What about Nick and Victor’s conflict? Will they ever be able to move past their issues? We’ll give you updates as other Y&R news comes in. Stay tuned to the CBS soap and don’t forget to check CDL often for the latest Young and the Restless spoilers, updates and news.